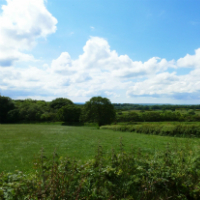 The sites of Blackdown and Down Garages in Mary Tavy were allocated for mixed use development in the Dartmoor National Park Local Plan Review, which was adopted in 2004. The Local Plan Review made it clear that the development should incorporate housing (including an element of affordable housing), parking provision for the village shop and public amenity space. It was emphasised that traffic calming measures and a contribution to education facilities would be sought and the development would be carried out in a comprehensive manner in accordance with a development brief that would be commissioned by the Authority. The main aim of the allocation was to improve the character and appearance of the centre of Mary Tavy, an opportunity which was expected to arise as a result of the anticipated closure of both the garages. Kingscourt Homes Ltd, the landowner of the now vacant Blackdown Garage site approached the Authority to promote the redevelopment of the site. In order to bring forward the timetable for enhancements to the village centre, Kingscourt Homes Ltd offered to assist the Authority by funding the preparation of the development brief. The Authority agreed and Tetlow King Planning (TKP) was commissioned to prepare the development brief. Jonathan Adams, Director, oversaw the preparation of the development brief. In consultation with the Authority and the Parish Council, he established the principal issues that the development brief should address and instructed specialist consultants to undertake the necessary research. This involved assessing contamination and geotechnical issues associated with mining activities; preparing a topographical survey; locating services; establishing highway and road safety requirements; identifying car parking and access issues; analysing local need for affordable housing; and assessing the local need for commercial development. TKP undertook a major consultation exercise with the local community and key stakeholders. A public exhibition was held at the local Parish Hall. This was advertised by distributing 500 leaflets to every household in the village. Jonathan Adams, Planning Officers at the Authority and other experts were available to answer queries. The exhibition was a major success and was attended by almost 75 per cent of the households in the village. Nearly 100 written responses on the development brief were received. This response enabled TKP and the Authority to agree on the contents of the final brief including the design and layout of the comprehensive redevelopment of the village centre. Dartmoor National Park Authority approved the final development brief and resolved to use the brief to guide future planning applications. Kingscourt Homes Ltd subsequently instructed TKP to prepare, submit and administer a detailed planning application for the mixed use development of the vacant Blackdown Garage site.